Sometimes a bad news story becomes more of a good news story. I spent Friday morning packing for an eagerly anticipated trip to Mont Aux Sources in the Drakensberg. We were 150km from home when I got a horrible call from Bernard at our security company COPS. He had been told that our house had been broken into and was on his way to investigate. I then saw that the children and the radio had prevented me from hearing 5 missed calls from my neighbour Sonja. The story which unfolded was heartwarming and leaves us most indebted to everyone who played a part. The gardener working across the road saw 2 men trying to get into our property at the gate, he alerted Barbara who lives in the house where he works, she called 10111 and had immediate reaction from them. At the same time the lady next door to her saw the same thing, pressed her panic button and alerted Lectronic security (who are not even our security company). At a third house across the road Mynhardt, who is in Matric at school, saw the men jump over our fence and also rushed to help. His mother Sonja was hijacked on Monday of the same week as she got home from work. Between the way he stood by his mother on Monday and his assistance in the present case, this young man has proved to be an absolute hero. At some point someone alerted the Parkdene CPF (community policing forum). Between our neighbours, the police, the CPF, and I gather at least 2 private security companies the wanna be burglars were surrounded in the nearby wetland and arrested. 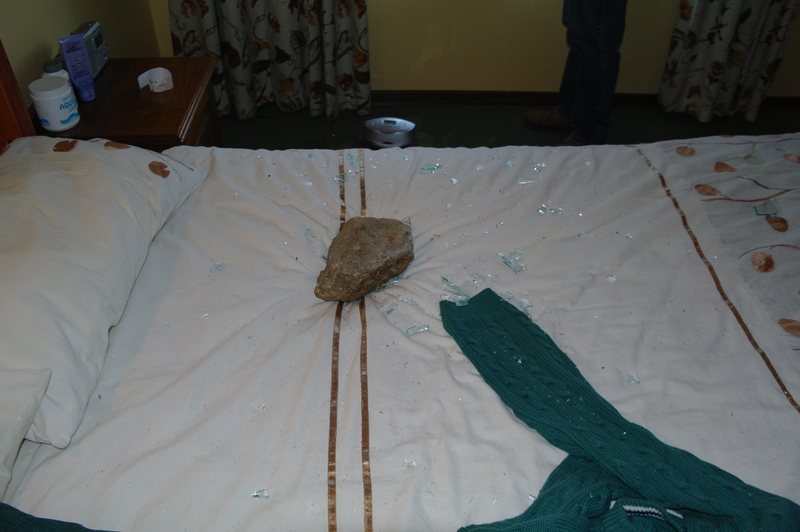 The burglars had thrown a rock through our bedroom window and created a hole big enough for a man to climb through. Mont aux Sources hotel were kind enough to change our reservation and we doubled back to return home. We missed out on a weekend in the mountains but we gained so much. We gained immeasurable faith in the goodness of near strangers. We gained trust and respect for the police in Boksburg. Instead of a dark feeling the experience filled us with warmth and goodwill. When we got home the police came to our house to open the case, they still had the burglars in custody. They were so professional. A big thumbs up to the Boksburg police!! Not only did they help us, but they also recovered Sonja’s car the same day that it was hijacked. The burglars did not know that we were away, they tried at least 2 other houses before ours. Apparently the burglars had travelled to Boksburg by train from Soweto. What happened did not just help our family it helps the entire community because word will get out that this is not a good street to hit. A big big thank you to all who were involved, we are so grateful! This really shows what can be done when the community and police work hand in hand. ** A little strange note to end this story. On Friday morning 5 year old Fjord said to me, “I had a horrible dream that we did not go on holiday because our house caught fire”. Not the identical scenario, but you have to wonder about the senses which children have which become dulled as we ‘grow up’. Wow an amazing story Sula…….sterkte!